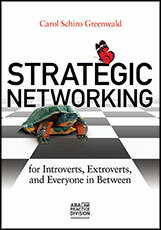 Provides both tangible and intangible tools to use when implementing their networking strategies. Participants learn how to build a contacts list, grow relationships, cultivate referral connections, be a resource for others, obtain business and widen their network of valued friends, loyal clients and dependable colleagues. Strategy is the key to successful networking. Strategy should reflect each individual’s personality, ambitions and druthers. Once a person identifies a way to network that feels comfortable the rest is logistics. Why? Because in networking attitude is more important than aptitude. Strategic networking is grounded in preparation. Efficient, effective networking requires goals, strategies and tactics all focused on a specific kind of client or niche market. Good networkers chose venues where their designated target goes, and prepare conversations of interest to the prospect. Best networkers give to get because in networking relationships what goes around, comes around. carol@csgmarketingpartners.com | 914 834 9320 | home | site map | ©2013- Carol Schiro Greenwald. All rights reserved.